Even Sports Fans Out Tailgating Need to Urinate! Is your family a group of sports fans out of control? Do you travel to games out of town and attend every local game possible? Do you love a good tailgating party before the game with your family and friends? If so, you probably hate using those dirty public restrooms at stadiums and during your travels to and from the games. There are solutions that will allow discrete urination without having to use those public facilities with germs, trash and other filth. Harris Interactive pro sports fan demographics indicate that during a recent season, 81% of diehard major league baseball fans attended at least one game; many attended several games. For pro sports fans of all types, 31% of the attendees also attend concerts, many of which are outdoors in stadiums and 31% of people who do not consider themselves among the real sports fans but love concerts also attended professional sports of one sort or another. Of these professional sports attendees, you can rest assured that many enjoyed a tailgating party before the event. This means that instead of only two hours or so without ready access to a clean toilet, there were many hours which passed between leaving their homes or hotel rooms where private, hygienic bathrooms were available. Instead, many absolutely dreaded having to walk far away from the group to visit a public restroom and, upon arrival, felt uncomfortable using the facilities due to crowding or lack of cleanliness. So, what choices are available for sports fans out of control that need to urinate? You’ll be happy to learn that there are several practical options. 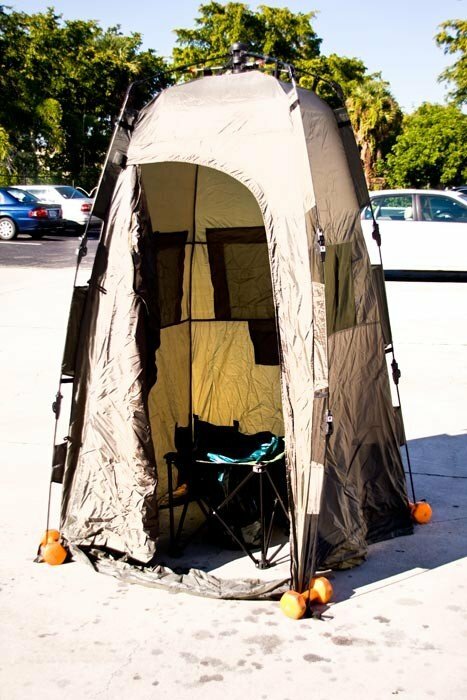 One solution is complete port o let kit called the Tailgating Porta potty that includes a privacy tent, portable toilet chair, and waste containment bags that can be thrown away. For more personal options, there is the use of an external catheter, available for men or women. The design for men is worn just like a condom and a plastic hose carries urine to a collection bag. The female model employs a fitted pouch that hugs the body and uses the same type of plastic hose and collection bag to store the urine until disposal is convenient. Under slacks, no one will ever that you have just discretely urinated! The collection bags are large enough to use all day without a problem. While the pouches which touch the body are not reusable, the collection bags and plastic hose assembly can be reused with proper care and cleaning. The external catheter solution even works during the sports event. There’s no need to stand in long lines waiting for use of public restrooms when you choose these solutions. And you do know you are a sports fan when you simply can’t take a break because you might miss an important play! Many sports fans that travel in a van or SUV love the TravelJohn solution. The plastic bag within a bag design contains a non-toxic gel. The unisex device can be used by men, women and children and has an adapter to make it one of the easiest to use devices for females. When urine contacts the gel, it solidifies, making the TravelJohn spill-proof. The portable potty is used until it is full or until the event is over and the exterior volume indicator makes sure you don’t overfill the bag. A person simply goes into the vehicle and discretely urinates while covering themselves for privacy. Still another option, the Little John portable urinal, provides a means for discrete urination by avid sports fans. The design is perfect for men but the Lady J adapter makes it great for women too. These plastic urine containers allow you to collect urine until you can properly and safely dispose of it. Ladies may find they prefer using the GoGirl female urinary device; either the Lady J or the GoGirl will allow a lady to urinate while standing. If you are a sports fan out of control, you’ll be happy to learn that there are so many choices for tailgating and even a solution that prevents the need to miss part of the event. Don’t miss a single minute of your next tailgating party or the sports event. Even if you have overactive bladder, you’ll be able to enjoy yourself without worries about getting to the restroom in time when you use solutions to discretely urinate.